Polynesians were thought to have gifted the World- Tattoos! The called it tatao, tattow, tatu or ta-tau, meaning “to tap or mark something.” The word was brought to England by Captain Cook during his voyages from Tahiti where he was introduced to tattoos. Tattoos were probably also used in ancient medicine as part of the treatment of the patient. The Eastern World is not immune to the tattoo culture either.The Japanese word irezumi means “insertion of ink” and can mean tattoos using tebori, the traditional Japanese hand method, a Western-style machine, or for that matter, any method of tattooing using an insertion of ink. With the Incredible imagery produced in the amongst the Hindu devotees,Bright colorful renderings of these multiple gods appear in paintings, sculptures and adorn religious text. 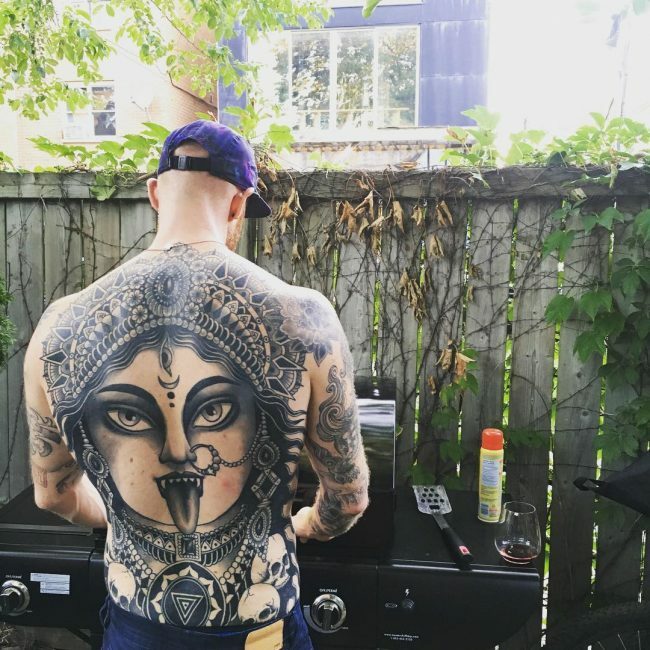 For Hindu’s who love body art (and sometimes even those who don’t practice the faith) these gods and deities make exceptional tattoo subjects rich with meaning. Kali – Kali is the regarded as the goddess of time, creation, destruction and power. She battles against evil and is seen as a divine protector. 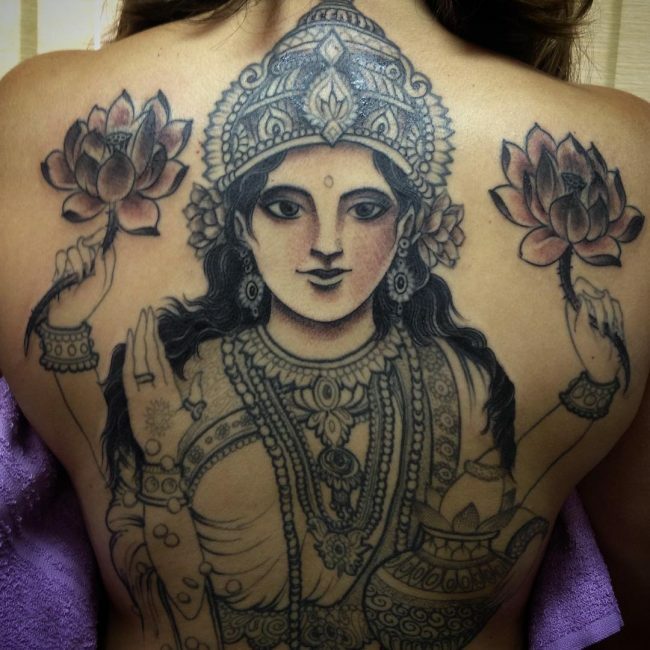 Tattoos of her often show standing over her consort Shiva. She is often designed with a blue face and a long, pointed tongue. Ganesha – This is one of the most popular and widely worshiped deities in the Hindu culture. He is depicted with the head of an elephant and a human body. He is regarded as the God of new beginnings who can also help remove obstacles. Those who choose him for their tattoo design may do so to represent a fresh start or as a symbol of good fortune. Om symbol – This is a sacred word and symbol in Hinduism. It refers to a supreme being, the soul, understanding of the universe and knowledge. The symbol is a commonly requested tattoo, even among non-believers. It is often inked in solid black, red or blue. Saraswati – The female goddess Saraswati has four arms and is often shown playing the veena (a plucked string instrument from ancient India), dressed in white and gold. For those who love the arts (and tattoo art! ), she is a perfect subject as she is regarded as the goddess of learning, music, and art. Lotus – This flower, which grows out from the mud, is a sacred flower in the Hindu faith and is associated with divine beauty, purity, and enlightenment. Lord Vishnu – This deity is one of the foremost male figures in Hinduism also sometimes known as Naravana or Hari. He is seen as a protector and is most often depicted as having a pale blue skin and four arms and holding objects such as the lotus flower, conch, and discus. Lakshmi – Lakshmi is the Hindu goddess of wealth and good fortune as well as material and spiritual prosperity. She is the wife of Lord Vishnu and is portrayed in tattoos with four arms often sitting or standing on a large lotus flower. If you want a small Hindu style tattoo you would probably want to go with a lotus or Om symbol. Tattoo designs of the various gods will always look better on a larger scale and most clients choose their upper arms, back, shoulders and chests for their tattoos. Hindu tattoos on the hands are also becoming more commonplace. These designs will usually include the Om symbol or Ganesha.